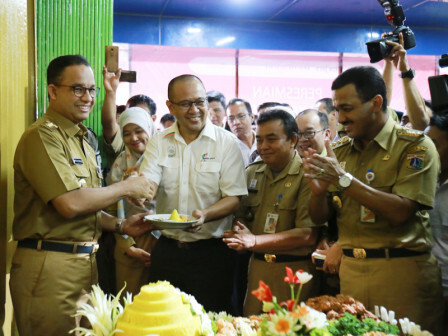 Jakarta Governor, Anies Baswedan has inaugurated the Karmat Jati Market, East Jakarta today, Tuesday (8/14).
" The market isn't only seen from its physical facilities, but also its success whereby it's seen from the arrival of traders and buyers"
According to Anies, the market looks better than before. "The market isn't only seen from its physical facilities, but also its success whereby it's seen from the arrival of traders and buyers. Thus this market lives, from the power of transactions between sellers and buyers," he expressed. In that occasion, he cuts the tumpeng and signed the inscription. Afterwards he went around checking market conditions and dialogue with several sellers. To the sellers and market proprietors, they were asked to maintain cleanliness. All interested parties in the market must own such property. PD Pasar Jaya President, Arief Nasrudin stated that revitalization that is conducted since 2015 takes three years by spending Rp 26 billion. The fund is taken from the company's independent funds, thus the market still exists and can compete in the current era. "We also revitalized the social and public facilities. Such as mosque, toilet with concepts like in malls. So it's clean, neat and comfortable," he uttered.